Most everyone carries too much gear (whether multi-day hiking, or just as a day pack). After my first solo hike of the Dusky Track Fiordland in 2006 (http://www.theultralighthiker.com/dusky-track-adventures-1/), the first thing I did when I came home was throw mout my old expensive hunting daypack. I had spent some time working out how to carry enough gear on (what was then) a 57 year old body (Oh Dear! was it ten years ago, really?) to last me up to a week in very rugged country where sub-zero conditions, torrential rain, and being flooded in were reasonable likelihoods – whilst at the same time being safe and comfortable. In the end I started out carrying just over 13 kg which diminished by over half a kilo a day as I ate the food and drank the Bacardi 151! The same trip now would see me starting with less than 10kg. I was there last year (2016). My wife Della and I (now 65) hiked the South Coast Track which I wholly recommend (http://www.theultralighthiker.com/fiordland-2014-2/ & following). In 2017 I hiked the Dusky Track again (and encountered a moose: http://www.theultralighthiker.com/from-dawn-to-dusky/ In 2006 I had chosen Gossamer Gear’s G4 pack at 454 grams to carry all this. Nine years later I am still using it for longer hunting and canoeing trips. As you can see, Joe’s 27 litre Zero pack weighs 113 grams! That’s quite big enough for a day, probably overnight! 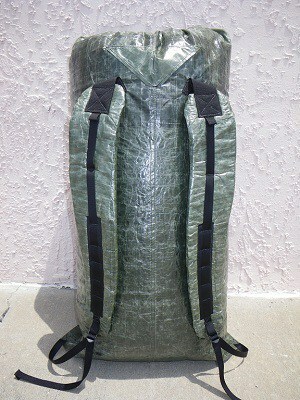 You could also use it as a stow bag in your main pack, and take it out and use it for hunting when you had made camp. Here is another (waterproof) possibility: http://www.seatosummit.com.au/products/outdoor/ultrasil-dry-day-pack/ (Joe also has a waterproof model). That taken care of, what should you take with you IN your day pack? Clothes: Raincoat. I have one from zpacks which weighs 130 grams, is wonderfully waterproof and breathable. Warm Jacket: a synthetic insulated jacket is a MUST in wet bush in the winter months; down is GREAT – what I use hiking – but riskier when it is VERY wet and cold, as in a Gippsland winter. A Montbell Thermawrap vest (188 grams) and jacket (240 grams) would be hard to beat along with an eg Icebreaker merino wool beanie (35 grms). However a peaked cap is a MUST for hunting. You CAN buy these in blaze orange (a good idea if you venture where there are likely to be others – I try not to). Really important if you are looking towards the rising or setting sun. Should you be prepared to sleep out? I think so. It happens sometimes to everyone! A very lightweight shelter and emergency space blanket bag is a good idea. You CAN make a mylar space blanket into a temporary shelter if you carry a bit of string – I always carry a small dental floss (now Dyneema fishing line) for 1st Aid and repairs: http://www.theultralighthiker.com/rope-dont-leave-home-without-it/) I will cover this in a future post about my Home-made Poncho-Tarp. If you can’t light a fire, something like a Blizzard Bag (http://www.blizzardsurvival.com/product.php/100/blizzard-survival-bag) might live in your daypack, but at approx 385 grams, you might just as well carry your down sleeping bag and hiking mat (See http://www.finnsheep.com/HIKING.htm) – perhaps 397 + 340 grams. Mind you, the ‘Blizzard’ can just live permanently in your pack. It will never get wet, will keep you safe even if the temperature falls to below zero, and IS waterproof. Includes a hood, so no shelter needed. Adventure Medical Kits have some other great options. You might notice that my weights 113 +240 +188 +397 +320 + 35 = 1293 grams are now almost exactly the same as my old EMPTY daypack. I need only to throw in an ultralight shelter such as this at 113 grams (http://www.zpacks.com/shelter/hexamid_pocket.shtml) and I am good to stay the night in sub zero conditions, wind and rain for 1406 grams, the equivalent of my old pack with a single muesli bar in it! The most important thing you will ever learn is how to light a fire when conditions are really dreadful. If you can’t do this, you really shouldn’t be out on the woods alone! See my advice about that here: http://www.finnsheep.com/HIKING.htm & here: http://www.theultralighthiker.com/how-to-light-a-fire-in-the-wet/ You will need (another) mini Bic lighter in a snap lock bag in your daypack with some bicycle inner tube as a fire starter – I assume you already have a mini Bic in your pocket for testing wind direction – but sometimes it drops out of your pocket, so another is just good insurance. I assume you will already have a knife so you can split wood and shave the inner dry wood to make excelsior, the very best fire starter. No doubt it has a secondary purpose for butchering/caping work. About the lightest suitable knife is this Ka-Bar: http://www.theultralighthiker.com/carry-a-knife/ – under 30 grams including sheath. Outdoor Edge’s Razor Blaze replaceable blade lock-blade folder (143 grams inc six spare blades) is a useful choice if you do much butchery as is this: http://www.theultralighthiker.com/ultimate-blades-for-the-ultralight-hunter/. A bone saw can be useful (antlers). I usually carry a length of ‘embryo wire’ available from veterinary suppliers. You just need to knot a length to two short pieces of wood (as handles) then you can saw someone’s head in half in a few seconds! You really should have a 1st Aid Kit. I have already mentioned the dental floss! A needle should accompany it – if only for sewing up your ripped trousers – I have also used it for sewing up ripped dogs; it would be equally useful for sewing up a ripped me! You CAN go overboard here. By the same token, you may carry, eg an elastic bandage or a sling (I have) in your pack for years before you really need them (in this case because my wife had dislocated her shoulder in a really remote place!) Some Panadeine Forte and anti-inflammatories will enable you to keep on moving when otherwise it would be very difficult. I recommend some Imodium: in the event of diarrhoea it is invaluable! Blister pads: also essential. Some bandaging (Band Aids, Elastoplast) and Leucotape. Likewise, Small quantity of iodine (sealed in a drinking tube); anti-fungal cream (Daktarin) same: a really bad sudden case in the crotch WILL be agony! Repellent – same. Mylanata Rolltabs in case of indigestion. Food: Probably the best thing to have in your daypack, because they will remain fresh for weeks and need no cooking are a full day’s ration of Carmen’s low GI Muesli bars (or like). If you are going to cook something, this is a great cup: http://www.traildesigns.com/cookware/vargo-450ml-travel-titanium-mug-eca355 Rand will also make you a Caldera Cone to fit it. The lightest cooking system. Check it out. PS: If you have been adding all this up you will see that the Daypack and all its essentials to survival (plus an enjoyable day or two hunting) still weighs less than 2.5 KG! If you don’t own a gram Kitchen scales, buy one now! How much does your daypack weigh?